Shimmer-y reverbs are perhaps a zeitgeist now, as developers return to digital effects and new twists on those ideas. From the team formerly at CamelAudio, we saw ChromaVerb in the Logic Pro X 10.4 update at the start of this year, and a couple of Max for Live devices have gone a similar direction. Luminance has the advantage of sounding unique, utterly beautiful, and with a clear, simple interface – one that lets you dial in just the amount of effect you want, while always producing lovely results. It’s probably the most accessible take I’ve seen on the idea, and the results sound modern and fresh without being too unfamiliar. In short: it’s some dreamy sauce you can add easily to anything. And that may explain its runaway sales. Mac-only developer Sinevibes has a strong following, but this particular plugin, the developer told us, has already far exceeded any other launch, even in its first 24 hours in the world. 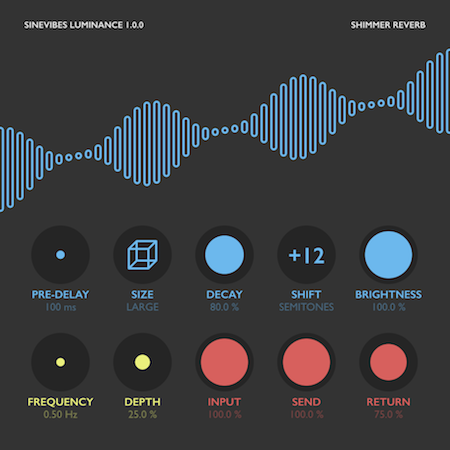 Luminance is a plugin for creating “shimmer reverb” effects – unreal acoustic space simulations which gradually pitch-shift the reverberation tail. It’s a novel take on this coveted effect, here based on a modern “feedback delay network” design with high-quality interpolation – plus quite a few original tricks such as phase-inverted time modulation, special configurations for damping and signal blending. All this gives Luminance a fresh and highly musical character: it smoothly follows the original melodies and harmonies and creates a lush background sound layer reminiscent of a dreamy symphony of strings or pipe organs. And to ensure highest possible day-to-day usability, Luminance has an easy-to-understand set of finely-tuned parameters. An update since launch has added compatibility fixes all the way back to Mac OS X 10.6 – there’s something you don’t hear often these days.